Text and photos by Pam VanderPloeg copyright 2017 unless otherwise noted. TODAY THE LIVING ROOM LIT BY THE AFTERNOON SUN. In 1922, four visionary businessmen sat in an old apple orchard near Franklin Street and finalized a deal that would turn a golf course into a neighborhood of gently curving streets and upscale homes designed in the popular historic revival styles of the day. 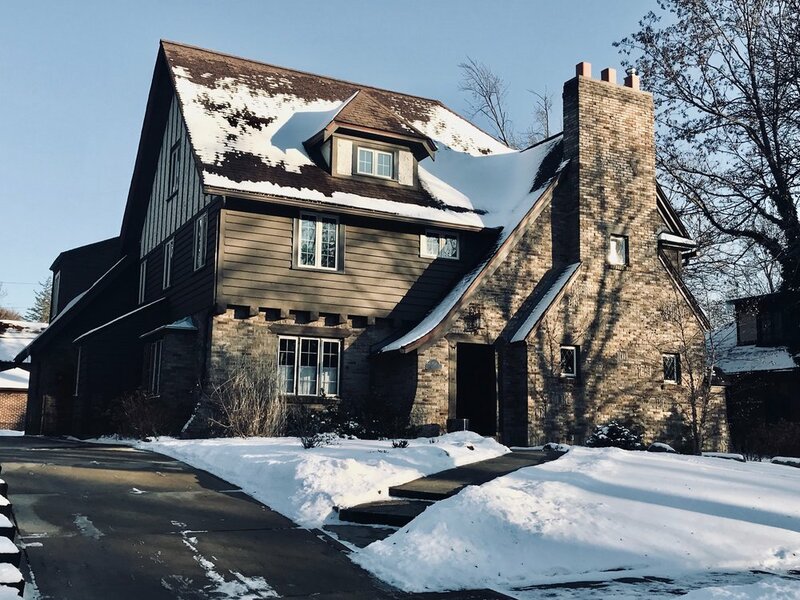 Indeed Joanne and Ron Rozema’s Ottawa Hills home is one of these, a 1927 English cottage style with a steep flared gable, dramatic stone chimney and multi-paned casement windows. It sits on Giddings at the western edge of Ottawa Hills. As soon as Joanne toured it, during a Sunday Open House, she knew it was going to be their new home. That was 1986, and today they still love their home and their Ottawa Hills neighborhood. The English style of the Rozema house does not end with the exterior. 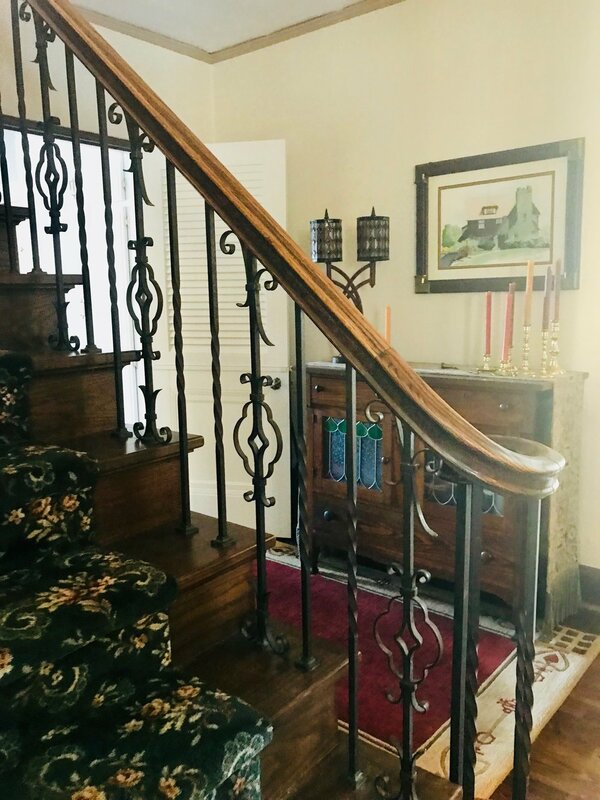 A heavy medieval style door beckons you to enter the central stair hall with its steep staircase and decorative iron railing. The walnut-stained beamed ceiling in the roomy living room is a contrast to thick cream-color stucco walls. A large fireplace is flanked by built-in bookshelves and twinkling lamps in the chimney niches. The Rozema’s baby grand piano does not feel crowded in this space. In 1927, the first owners must have been as equally charmed as Joanne when they attended the new home’s open house. Back then, 91 years ago, the house was decorated bottom to top by Wurzburg’s Interior Design Department that supplied everything from drapes to furniture. For that 1927 open house, nothing was overlooked from vases filled with fresh flowers to a vacuum sweeper and washing machine to keep the house and the occupants clothes clean. 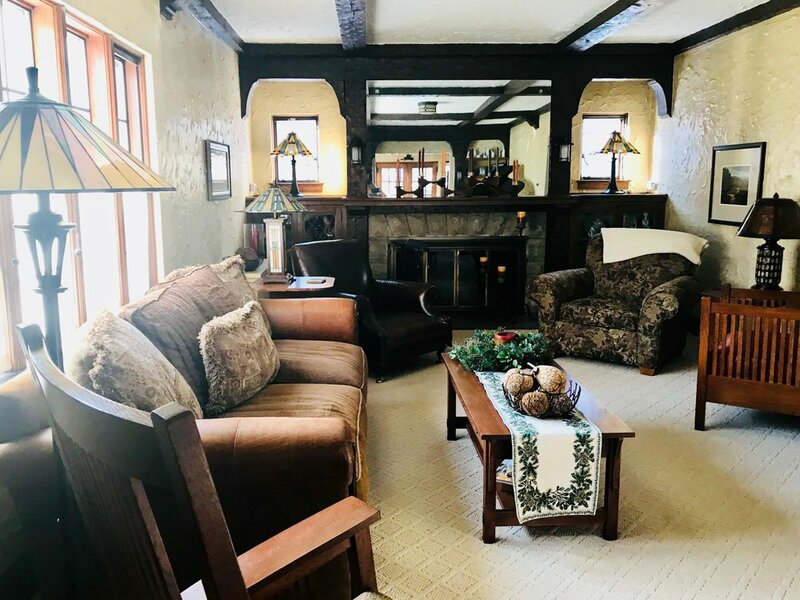 The writers of the Building Section of the Grand Rapids Herald described the living room’s draperies of henna, orange and apricot, paired with a pale green sofa, oriental rug and an Armstrong grand piano in the “William and Mary” design. 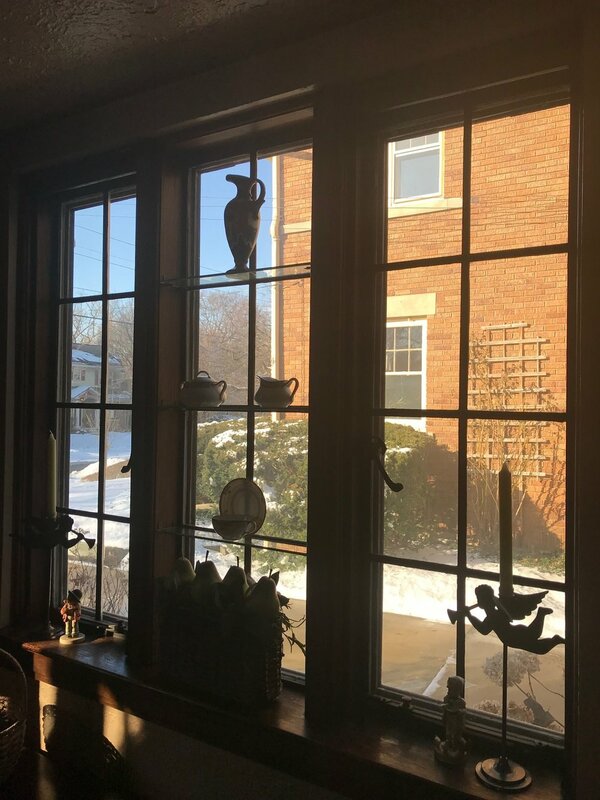 TODAY THE BREAKFAST NOOK OVERLOOKS THE GARDEN AND THE LIGHT FIXTURE, LIKE THOSE THROUGHOUT THE REST OF THE HOME, WAS CAREFULLY SELECTED TO ADD, NOT DETRACT, FROM THE HOME'S ORIGINAL CHARM. The dining room was furnished with a Duncan Phyfe dining room suite, satin and moire stripe window hangings and a blue oriental rug. While lingering over morning coffee seated in comfortable maple furniture you could look out on the garden through the cheery chintz curtains in the windows. The kitchen had gray cabinets and stylish bright yellow housewares. Both the breakfast nook and the sun room provided pleasant views of the backyard. For the open house, the sun room was staged and ready for a bridge game with a “bride’s table” and four chairs. 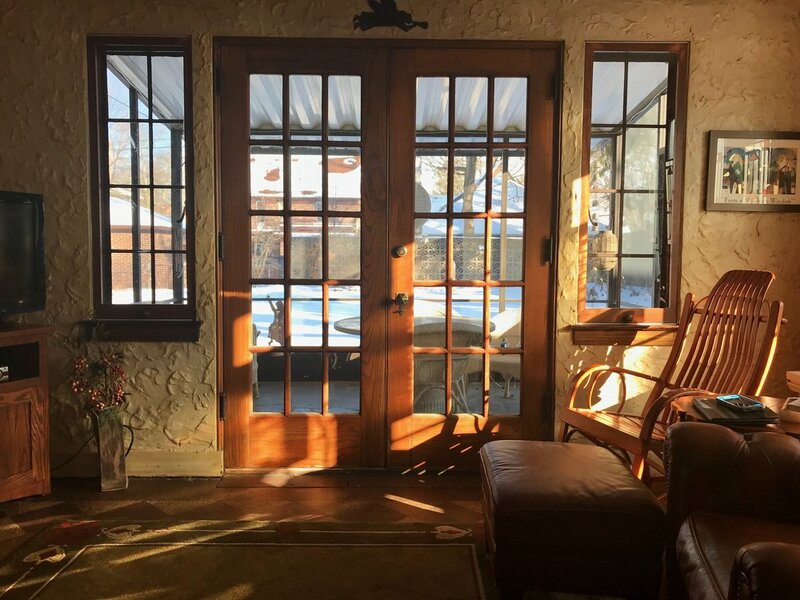 Today those same leaded glass casement windows let in the brilliant sun to shine on the original cork floor, and provide a view into the porch with its vintage slate floor and beyond that the expansive backyard. TODAY THE SUN ROOM HAS THE ORIGINAL CORK FLOOR, STUCCO WALLS AND WOOD TRIM AND LEADS TO THE PORCH WITH AN ORIGINAL SLATE FLOOR. The 1927 open house was hosted by the firm of Dykema, Carmen & Dykema. It is not specifically stated in the Herald article if they designed and built the house. I assumed they had. The firm designed homes on Uplands in the “Golden Triangle” area of Grand Rapids Township and at least one in Ottawa Hills Plat #2 in East Grand Rapids, a few blocks away. However, after Joanne and Ron moved in they received information from their new next door neighbor, by way of an earlier owner, that both houses were designed by Alexander McColl. According to Joanne, when they bought the house in 1986 it was move-in ready. 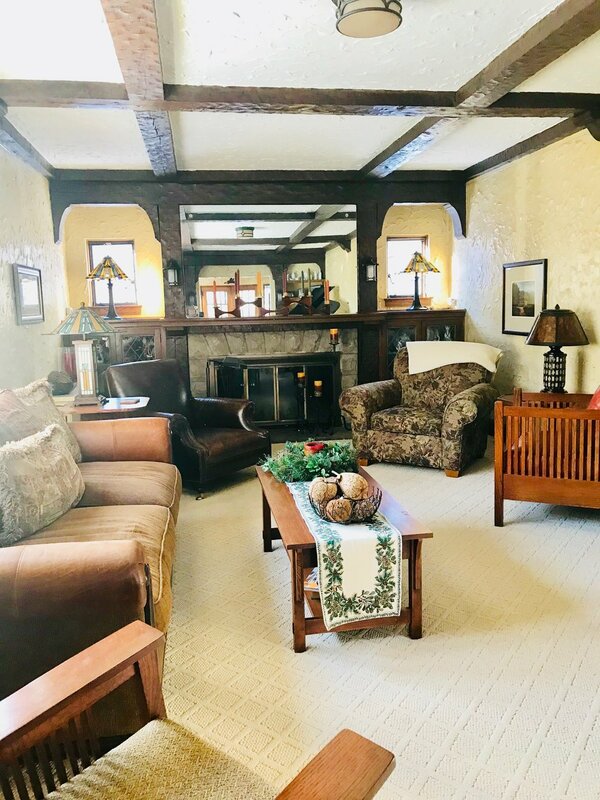 They ripped heavy draperies off the windows to let the light in and removed the worn 1970’s shag carpeting to reveal a hardwood floor in good condition. The ceiling and beams were in fine shape and to this day the stucco walls retain the same creme color and have not required repainting, The Rozemas were somewhat shocked by the profusion of wild reds and pinks they found in the kitchen, including pink laminated countertops, so they replaced it with a modern, efficient kitchen in light neutral colors. When they removed the kitchen floor, they found underneath the original battleship gray linoleum. THE SPACIOUS MODERN KITCHEN HAS A VINTAGE CHARM BEFITTING THE HOME'S ENGLISH COTTAGE STYLE. EARLY GREEN AND WHITE TILE IN ONE OF THE UPSTAIRS BATHROOMS.. The second floor has five generously sized bedrooms and three full baths all arranged nicely around a generous landing. The burnished interior wood doors are a nice compliment to the redecorated bedrooms. The bathrooms are also updated, but my eyes immediately seized on the one bathroom with the original soft green tile as described in that 1927 Grand Rapids Herald article. MORE HISTORY PRESERVED: THE MAID'S BATH JUST AS IT WAS ON THE THIRD FLOOR WITH ORIGINAL CLAW FOOT TUB. The third floor is pretty amazing. It’s a large space that could be tapped for some future use as a master suite, studio, playroom, or whatever a house with five bedrooms still needs. Here we found the maid’s room, originally furnished by Wurzburg designers with cheery chintz curtains. Tucked away by the maid’s room is a private bathroom with its original clawfoot tub. And of course, on the lower end of the house there is a large basement, neatly arranged with laundry and utilities, where you can still see the old coal delivery chute and storage bin and where the old pool controls were located. Ron says actually the biggest and best house investment they made in the beginning was the repair and renovation of that beautiful outdoor pool, which they really enjoyed when their daughters were at home and could bring their friends. When I reflect about our time chatting with the Rozema’s, I know that what Jon and I especially loved was the reverence Joanne and Ron have for the house. Certainly as they make steady and continuous improvements, the Rozemas have treated their Ottawa Hills home with the respect it deserves. And still today with their adult children in far-flung places, they are in no hurry to leave their dream house.